Rhinoviruses: more than meets the eye? Have the rhinoviruses coughed up all they have to offer? Rhinovirus infections cause at least 70% of virus-related wheezing exacerbations and cold and flu-like illnesses. Infections are also associated with otitis media, sinusitis and pneumonia. The annual impact of human rhinovirus (HRV) infections costs billions of healthcare dollars. To date, 100 serotyped HRV or 'classical' strains have been divided between two genetically distinct species based on subgenomic sequences, but many more, apparently novel strains remain un-characterized, circulating in unknown patterns and causing undefined illnesses. Until recently, the genomes of less than half the classical strains had been sequenced. In April 2009, the remaining classical HRV genome sequences were reported. These data will inform therapeutic development and phylogenetic analysis for this subset of HRV strains but should be viewed as one step in a long road leading to comprehensive HRV characterization. Human rhinoviruses (HRVs) are the most common cause of acute respiratory tract illness globally , infecting both upper and lower respiratory tract tissues [2, 3]. They cause more asthma [4–6] and chronic obstructive pulmonary disease (COPD)  exacerbations than any other factor identified to date, in addition to the majority of cold and flu-like illnesses (CFLIs) . It is interesting to note that, in contrast to many of the other well-known respiratory viruses, the clinical symptoms of HRV infection are primarily caused by the host's immune response to infection rather than by viral cytopathicity [9–12]. HRVs are the most common reason for prescribing antibiotics  and are associated with pneumonia , otitis media  and sinusitis . Up to a quarter of children worldwide experience asthma symptoms, with prevalence plateauing in some countries while rising in other parts of the world . In adults, COPD exacerbations are predicted to soon become the world's third leading cause of death . The HRVs therefore create an enormous direct and indirect social and economic burden across the developed and developing world [18, 19]. Until recently, less than half the genomes from the approximately 100 serologically defined 'classical' strains (also called serotypes or types) had been sequenced. A handful of strains have had capsid structures experimentally defined and some have been subject to immunological investigations. Now, Palmenberg et al. have completed the sequencing of all classical HRV genomes. From the 1960s to the 1990s, human infection and culture-based methods of HRV detection prevailed, often augmented by strain typing using neutralizing antisera . The impracticality and insensitivity of these methods [22, 23] resulted in the misconception that compared to influenza virus and respiratory syncytial virus, for example, HRVs had straightforward and relatively minor roles in illness. This thinking limited their further characterization. Polymerase chain reaction (PCR)-based methods subsequently started to reveal the extent and complexity of HRV-induced illness  and have identified the frequent occurrence of co-detections, including some involving HRV strains, in respiratory specimens. Associations between an illness and a single respiratory virus, assumed because it was the only virus detected, now require re-examination to confirm that the association holds true. Previous concept-defining HRV-related epidemiology was conducted without knowledge of the numerous co-circulating respiratory viruses discovered since and was biased by the inability of culture to detect certain strains and species. Many of the 20th century's conclusions about HRVs will need to be revisited using modern methods. To date only one HRV strain, HRV-QPM, has been a deliberate target for intensive study using molecular tools . In 2006 a large clade of divergent but inter-related strains was reported , and is now recognized as a proposed third species; HRV C. The HRV Cs were found entirely by molecular means from specimens collected in 2003/2004 [26–30], reflecting the unsuitability of culture for sensitive and comprehensive screening. HRV Cs have been heavily associated with wheezing illness but remain 'unculturable', perhaps reflecting their preference for different cell lines than those used routinely . The turn of the century has seen many significant advances in our understanding of the genetic diversity, genomic features and clinical impact of infection by the HRV group, as well as the immunological interactions of a few strains. The first classical strains were officially named in 1967 , the last in 1987 . Sequencing of the 5' untranslated (5'UTR)-VP2 region was completed for all classical strains in 2002  and the complete set of 1D regions was available in 2004 . In 2007 Kistler et al. added 28 genomes  and Tapparel et al. 12, including one common to both studies . All these data have provided tools to expand our knowledge of the phylogeny, evolution and epidemiology of HRVs and to predict their drug susceptibility, with reports indicating that subgenomic regions usefully represent the known genomes [34, 35]. Completing the sequencing of all classical strains has allowed more comprehensive in silico analyses than have been possible to date. Examination of the entire set of HRV coding and non-coding regions by Palmenberg et al. produced data that support recent reports of recombination among the HRVs , but other intensive analyses indicated that this is not a driving force behind HRV evolution [35, 38, 39]. The discrepancies may be due to the different numbers of classical strain sequences used in each study, the different origins of the viruses used for sequencing, or the way predictive algorithms were configured. The ability of HRVs to recombine in practice awaits empirical evidence. Fascinatingly, one of ten field strains (HRV-54f05) sequenced by Palmenberg et al. was predicted to be involved in recombination events from which seven classical strains arose compared to only one event for the American Type Culture Collection (ATCC) variant of the same strain. Previously, one strain needed to vary only at a few epitopes to be considered distinct from another. Now, when comparing molecular rather than antigenic differences, two variants of the same HRV strain (HRV-54) are found to differ across the genome by almost 600 nucleotides (91% identity, equating to 46 amino acid changes resulting in 98% amino acid identity). This raises several questions. How quickly does intra-strain genetic variation occur? Can such variation accumulate in sufficient quantity to require that a clinical HRV isolate or PCR detection be reconsidered as a distinct strain? Are new HRV strains actively emerging? These questions are especially important given the obvious impact of nucleotide sequence variation on evolutionary conclusions. Future studies may address the extent and location of genetic differences between clonal yet low-passage field strains  versus culture-adapted ATCC strains. Palmenberg et al. also proposed that a previously identified (HRV A' ), small but divergent clade within the HRV A species, which was renamed clade D, may represent a new species of HRV . When aligned together, two of the three members of this clade (HRV-8 and HRV-95) differ by no more than 81 nucleotides (>98% identity) or ten amino acids (>99% identity) and should be recognized as a single strain, as has been noted [20, 34]. The International Committee on Taxonomy of Viruses (ICTV) set 70% amino acid identity in two key regions as part of the demarcation between species within the genus Enterovirus. The definition is met in the 2C+3CD genomic region for assigning clade D to a novel species, as it exhibits >89% average amino acid identity between the clade's two distinct members but only 65% identity to other HRV A strains. However, the clade remains similar enough to the other HRV A strains in the P1 region (>70% average identity), its choice of receptor (major group ) and its similar G+C content. Clade D's antiviral profile is more similar to the HRV B strains (antiviral group A). Other genetic findings from the report of Palmenberg et al. build upon those described previously for the classical HRVs [35, 36]. These new sequence data are valuable contributions to pure knowledge, to future rational drug design and for addressing outstanding phylogeny-based issues. However, the data do not directly contribute to more clinically relevant areas of research, such as diagnostic assay design, epidemiology, immunology, viral interference and co-infection, clinical impact, differential diagnosis and infection control. To address these areas is a daunting task because to be most informative, future respiratory virus studies, whether for HRVs or other viruses, should undertake an all-inclusive approach towards virus characterization. To give statistical power to the findings, large populations should be screened regularly regardless of symptoms (addressing persistence and pathogenicity), for all viruses (addressing co-infection and interference) across multiple years (addressing recurrence and seasonality) under case-controlled conditions. Ideally, hospital and community-based settings would be sampled in parallel (addressing pathogenicity in both groups), including the collection of appropriate material to permit serology and immunology investigations. These studies will need comprehensive and reliable molecular assays capable of detecting all instances of each virus or virus group and would benefit from an internationally collaborative approach. Many novel HRV A, B and C strains are found when HRV-positive respiratory specimens are typed using subgenomic regions [24, 26] (Figure 1). There are likely to be many more when sampling extends over a greater period of time, since HRV strains do not always recur every year at a single location [42, 43]. It is likely that our current PCR-based methods could identify more than 100 novel HRV strains, raising more questions. What drives the development of so many strains when compared to the small number of strains of other RNA virus species? And why are so many similar strains apparently retained as stable viral entities over time? Scope of the uncharacterized diversity within the HRV supergroup: 428 classic and novel HRV A (red), B (blue) and C (green) species sequences were aligned using Muscle within Geneious Pro v4.6.1. The circular neighbor-joining tree (Tamura-Nei model; 100 bootstraps with consensus support shown at the nodes where space permitted) was produced using Geneious Tree Builder and rooted using CVA-21 (pink). Only sequences included in the report by Palmenberg et al. are labeled (multiples of the same strain are identified using the first two characters of the GenBank accession code or 'ATCC' to identify their origin as per reference ). Putatively novel strains and their variants are represented with a terminal gray circle. The subgenomic fragment spanned 266 nucleotides of the 1A (VP4)/1B (VP2) junction. CVA, coxsackievirus A; HEV, human enterovirus; PV, poliovirus. Palmenberg et al. conclude that future HRV epidemiology should make use of full genome sequencing rather than serotyping. Clearly, serotyping is no longer best or even most frequent practice, but it is to be hoped that future studies can determine sequence regions that suitably replicate these subdivisions, avoiding costly, time-consuming and technically demanding complete genome sequencing. Currently, it is impractical for most diagnostic and many clinical research laboratories to routinely sequence the full genome of every HRV detected, a task made especially daunting by the high prevalence of these viruses. The 1D region is the best subgenomic target for enterotyping  and has previously proven suitable for rhinotyping. However, the extent to which intra-species recombination will render subgenomic regions unreliable indicators of strain identity is a new source of uncertainty. The use of capsid-derived subgenomic regions for speciation remains reliable. Regions with high inter-strain sequence homology, such as the 5'UTR, are understandably risky targets for strain or species typing. An agreed upon definition of what constitutes a distinct HRV strain would be helpful for future studies and may become available from the Picornaviridae Study Group  in due course. Once all HRVs are identified, we may reliably define associations between strains, clades or species and clinical illnesses and syndromes. Characterizing the full spectrum of HRVs, including full genome sequencing, will better inform our efforts to create reliable therapeutics, such as antivirals that reduce viral replication and the symptoms of illness. The scope of HRV antigenic diversity and the possible importance of frequent, mild HRV infections for the development of a robust antiviral immunity during the early years of life may mean that a sterilizing vaccine, if feasible, is not desirable. 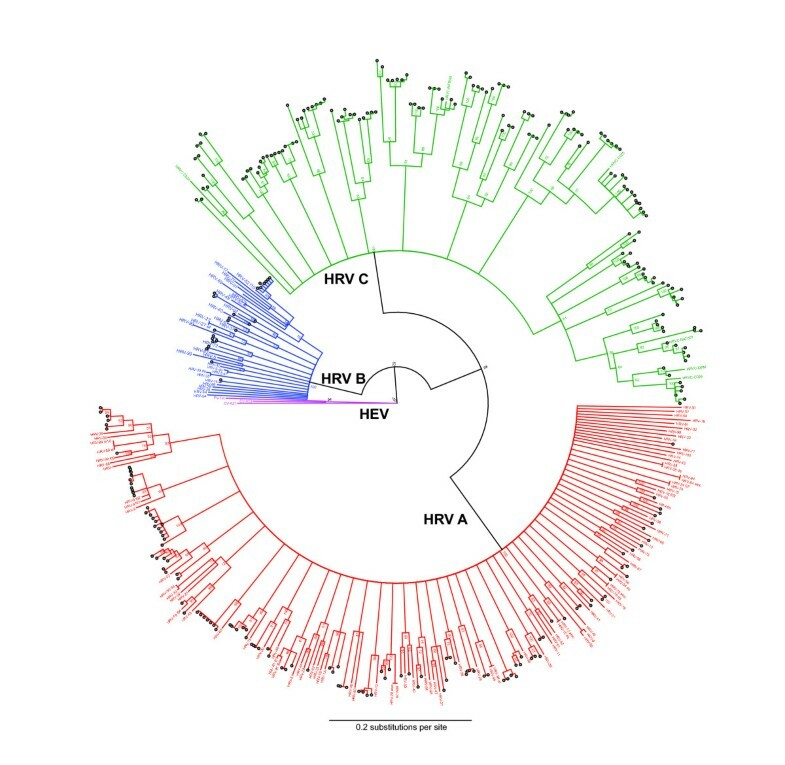 Although HRVs have increasingly become thought of as a single viral supergroup, now residing alongside their cousins in the genus Enterovirus, there may be important, discriminating antigenic, immunogenic, epidemic, clinical [20, 46] and now genomic features that support the treatment of some strains, clades or species as discrete viral entities, deserving targeted antiviral interventions and virological, clinical and epidemiological characterization . The rhinoviruses, known for decades, but often considered less of a public health and research priority than other viruses, may at last be facing the modern molecular, epidemiological and clinical research onslaught due such an intriguing group of pathogens. IMM leads a research team, including KEA, that focuses on the identification of novel respiratory viruses followed by characterization of their virological and immunobiological features, epidemiology, and clinical impact among pediatric populations. We thank Laura Shackelton, Laurent Kaiser, Peter McErlean, Caroline Tapparel and Daniel Gerlach for helpful discussions and advice. The authors' research is funded by the National Health and Medical Research Council (grant number 455905) and Royal Children's Hospital Foundation (grant number 10281). Both authors contributed to the writing of the manuscript and have approved the final version.